For nearly two decades, Metropolitan Stadium was the home of some great Minnesota Vikings teams. In 1953, officials began looking at sites to construct a stadium that could possibly bring a baseball or football team to the area. In 1955, a farm was chosen as the stadium site in Bloomington, MN, a suburb of Minneapolis. Construction on Metropolitan Stadium began in June 1955. The stadium was completed in just one year and opened on April 24, 1956. Initially, the stadium was the home of the Minneapolis Millers (minor league baseball). Metropolitan Stadium consisted of a massive three tier grandstand that could seat 18,200 fans. In August 1959, five local businessmen were awarded a franchise in the new American Football League. Five months later in January 1960, the same ownership group consisting of Bill Boyer, Ole Haugsrud, Bernie Ridder, H. P. Skoglund and Max Winter forfeited its AFL membership in order to be awarded a NFL franchise. The Minnesota Vikings were born when they played their first game against the Chicago Bears at Metropolitan Stadium on September 10, 1961. 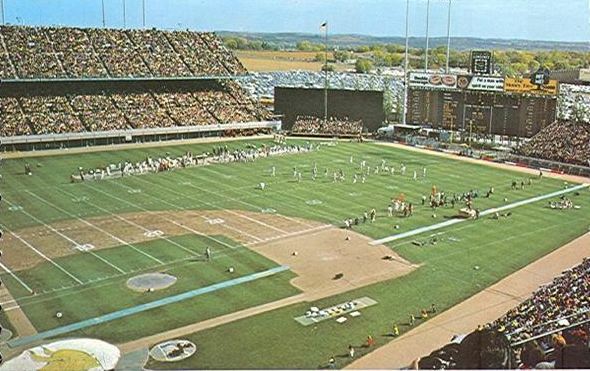 By the time the Vikings moved into the stadium, it had gained a professional baseball tenant; the Minnesota Twins. The capacity of Metropolitan Stadium grew from 18,200 to over 40,000. By 1965, a double decked grandstand was added along the south sidelines, replacing the bleachers and increasing the seating capacity to 45,919. The scoreboard was located beyond the east end zone. After the expansions in the 1960s, Metropolitan Stadium remained the same until it closed. Between the late 1970s and early 1980s Metropolitan Stadium fell into disrepair leading to the Vikings and Twins to want a new stadium. As a result, the Metrodome, a domed stadium, was built in downtown Minneapolis for both teams. The Vikings played their last game at Metropolitan Stadium on December 20, 1981. The stadium was demolished in 1982 and The Mall of America sits where Metropolitan Stadium was once located.